You are currently browsing the tag archive for the ‘Flying Mouse’ tag. ‘The Flying Mouse’ is a musical short about a little mouse who wants to fly like the birds. A blue fairy grants him that wish, giving him bat-like wings, but he soon discovers that these don’t bring him any luck: he is not allowed to join the xenophobic birds, not recognized by his relatives and called ‘a nothing’ by a group of crooked bats. Luckily, the same fairy releases him from his wings and in the end we see our little hero running to his mother in the sunset light. This cartoon is one of many silly symphonies that seem to aim directly at kids and that are rather moralistic. This seems to be a strong trend in 1934 and it gradually led Disney away from carefree humor towards sugary sanctimony. This cartoon is quite humorless, yet beautifully drawn. 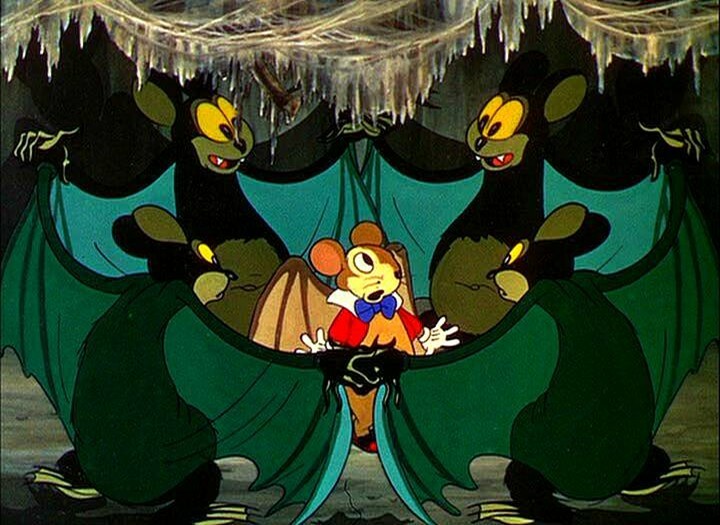 The blue fairy is a good try at the human figure (if not near the humans in ‘Snow White and the Seven Dwarfs’ (1937), let alone the blue fairy in ‘Pinocchio‘, 1940), and the mice, designed by Albert Hurter, are drawn much more realistically than Mickey. Moreover, ‘The Flying Mouse’ is another stunning example of character animation: our main hero acts out his feelings mostly in pantomime. Nevertheless, we can feel his joy, his embarrassment, his fear and his grief. It’s this combination of ambitious designs and great character animation that makes Silly Symphonies like these stand out among the cartoons of the thirties. Indeed, it was this particular cartoon that prompted Frank Thomas to try to become an animator at Disney’s. Thomas joined Disney on September 24, 1934, only a few months after this cartoon. He would stay with the studio until 1978, becoming one of Walt’s ‘Nine Old Men’. He is especially famous for his emotional animation, e.g. the dwarfs’ grief in ‘Snow White and the Seven Dwarfs’, Pinocchio trapped in the birdcage in ‘Pinocchio’, the romantic diner in ‘Lady and the Tramp‘ (1956), and Baloo trying to tell Mowgli he cannot stay in the jungle in ‘Jungle Book’ (1967).